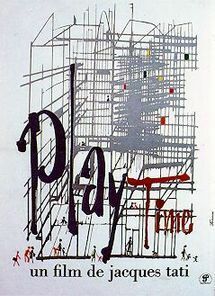 Play Time is French director Jacques Tati's fourth major film, and generally considered to be his most daring film. It was shot in 1964 through 1967 and released in 1967. In Play Time, Tati again plays Monsieur Hulot, a character who had appeared in some of his earlier films, including Mon Oncle and Les Vacances de Monsieur Hulot. However, by 1964 Tati had grown ambivalent towards playing Hulot as a recurring central role. Unable to dispense with the popular character altogether, Hulot appears intermittently in Play Time, alternating between central and supporting roles. Shot in 70 mm, Play Time is notable for its enormous set, which Tati had built specially for the film, as well as Tati's trademark use of subtle, yet complex visual comedy supported by creative sound effects; dialogue is frequently reduced to the level of background noise.